Fresh, tangy wine for summer. It features aromas of tropical fruits with a hint of blackcurrants and a mineral note. The Dornier Cocoa Hill Sauvignon Blanc is a fresh wine with a bouquet of notes of tropical fruits with a hint of blackcurrants. On the palate, nuances of pawpaw and grapefruit are detected. A mineral note also comes along. The Dornier Cocoa Hill Sauvignon Blanc successfully ends with a lingering freshness. 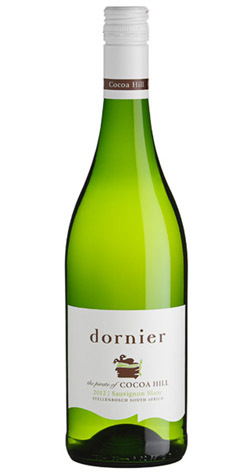 Dornier is a family-owned, sustainably-farmed Stellenbosch winery specializing in Chenin Blanc and Bordeaux varietals. Dornier���s loft-style winery is a new attraction in the Cape Winelands. With its curved roof and the use of face brick and reflecting materials, the building blends creatively into the dramatic scenery of Stellenbosch Mountain. The style of the winery is a visual translation of their wines – elegant, clear yet complex and distinctly unique.